Louisiana-born Mary Gauthier has lived more lives than a cat – and they all resonate through her songs with a truth and authenticity that goes way beyond the mainstream tropes of country and western music. This, after all, is a woman who lived among addicts and drag queens as a teenage runaway, fell prey to a spell of drug addiction of her own, and recovered to run her own small chain of Boston restaurants before selling up to become a full-time songwriter. 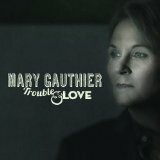 On her new album, Trouble and Love, Gauthier’s voice wears the scars of experience with hypnotic dignity, slipping in and around the powerful narratives of her songs with an easy musicality that also allows her to give her more trenchant observations a defiant edge. It’s a voice steeped in hard-earned wisdom, with no time for the self-pitying sob. There’s an assured intimacy which hints at the overall themes of the record, the first on her own label, of independence and moving on. Co-produced with Patrick Granado, Trouble and Love grows greater with each listen. Gauthier’s formidable song-writing talents are complemented by contributions from Beth Nielsen Chapman and, on the bittersweet journey of “How You Learn to Live Alone”, the sublime Gretchen Peters. These are formidable partnerships that strike lyrical sparks, epitomising the strength of contemporary song-writing that flows out of Nashville.